Back to the release of the second developer beta for OS X El capitan, Apple has hinted that they plan to release a 21.5- inch iMac with a 4K display. As the sources it will be release with new features for their fans. As the report states, Apple will unveil the public launch of OS X El capitant in late October in the desktop alongside. Additionally they tell that the machine will begin shipping in Novemeber. 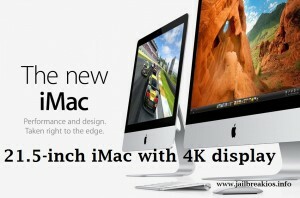 However, the new iMac’s price will be higher than the 21.5- inch iMac, but actually this is the one of the guess. I think that iMac release will be the surprise for Apple users. Ming-Chi Kuo confirmed earler on September 3 that Apple is planning on bringing iMacs with “Much better displays” to the future market. Do you can guess how will be iMac new one? We hope to tell you in future that when will be release it for you. It is amazing to look at and amazing to use. A big, bold display, powerful graphics and fourth generation intel core processors, advanced fusion drive option and much more come out in iMac. Here is the iMac special offers list give for you. Huge, LED backlit widescreen display. It is easy to your eyes actually it is phenomenal. You can see the innovation in the iMac screen. Beautiful 21.5 – 27 inch display. IPS technology, LED backlighting and true-to-life color every time for you. Fourth generation Intel Core processors powered to iMac. iMac graphics are more powerful, fluid and fast. You can take experience 3D games and HD videos with more speed. Thunderbolt – There are two Thunderbolt ports included every iMac. The tiny Thunderbolt port offer fast transfer speed and expansion capabilities. USB 3 – Every iMac included four USB 3 ports. It fast as USB 2. So you have peripheral possibilities to include printer, Apple USB SuperDrive and iPhone or iPod. Additionally, the USB 3 ports are compatible with USB 2 devices. 802.11 ac Wi-Fi – iMac supports ultrafast 802.11 ac W-Fi. You can get new experience up to 3x faster wireless performance. Audio and visual – Massive and high-fidelity sound stage, can heard loud and clear, FaceTime HD camara for high-resolution video calls. Wireless magic mouse or magic trackpad – You can do click, two button click at same time, 360° Scroll, screen zoom, two finger swipe. New apps for productivity, creativity and everything you need – iMac comes with iMovie, photos, pages, keynote, number and garageband. So you can do anything with your video, documents, photos, presentations and music. iCloud stores – It will give access to photos, documents, music, contacts, calendars and more.